This product has $1 service fee as required by LycaMobile. 1-845-301-16121-845-301-1612 or dial 612 from your mobile. 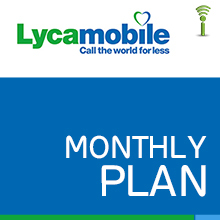 LycaMobile Number is required to be provided in the shopping cart, and minutes will be directly loaded to the provided LycaMobile mobile number. - For technical assistance, please call 1-845-301-1612.